Many American states have created tax incentive programs to maintain businesses, attract businesses from other states, and stimulate new start-ups. Tax-related incentives for business began in colonial times and have increased over time. According to Chi and Hofmann (2000), the number of states with tax incentives for businesses steadily increased since the 1980s. For example, 24 states offered tax incentives for job creation in 1984; 43 states offered those in 1998. R&D tax incentives were offered to businesses by 9 states in 1974 and by 39 states in 1998 (Chi & Hofmann, 2000). The reason for the increasing use of business incentives is that states see positive effects from these programs. States believe that tax incentives are good fiscal and economic tools. Public officials create economic development programs to influence firm relocation and expansion, or rescue failing businesses, or protect them against competition, or start-ups (Burnier, 1992). The governments perceive tax incentives as revenue foregone because they are not cash paid-in. States view that benefits of tax incentives outweigh costs in the long-term (Buss, 2001). In spite of predicated benefits and billions spent annually, states do not evaluate tax incentive programs (Bartik, 1991). Buss (2001) argues that most business tax incentives are the outcome of interstate competitions to attract businesses from other states. Are tax incentives good economics or simply politics? The broad use of incentives has generated interest in the effects of incentives on employment growth and regional economic growth. In this overview, I select several most cited and recent research works to illustrate the effect of tax incentive programs. How do states implement incentives? Do tax incentives induce regional economic growth? How effective are tax incentive programs? By reviewing the literature, I capture some answers to these questions. Researchers have utilized different methods to evaluate the costs and benefits of tax incentives. A good number of literature shows that certain types of tax incentive programs have positive effect on local job growth (Luger & Bae, 2005; Billings, 2008; Douglas & Paulo, 2008; Bartik, 1991). But many studies find an ambiguous relationship between tax incentives and economic growth (Fisher & Peters, 1997; Gabe and Kraybill, 2002). This review synthesizes these findings, methods, and data used. Because of the complications of evaluation and paucity of data, many sub-questions still need to be studied in- depth. States offer incentives for businesses under two main categories: tax exemptions and financial incentives. Within 15 tax exemption programs, the most commonly used tax exemptions are on corporate income, land and capital investments, raw materials and equipment in manufacturing, and creation of jobs. Financial incentives offer cheap financing for 16 kinds of business activities, including bond financing, loans for building constructions and equipment, and financing aid for plant expansion (Chi & Hofmann, 2000). The literature discussed in the review cover a broad range of tax incentives. For example, the case study of North Carolina by Luger and Bae (2005) focuses on tax credit for job creation, machines and equipment, central administrative offices, and R&D. Studies of BMW plant in South Carolina (Douglas & Paulo, 2008) and enterprise zones in Colorado (Billings, 2008) show that targeted tax incentives attract private firms to a new location, stimulating the economy and creating jobs, through multiplier effect. The classic theory to demonstrate the economic growth from tax incentives is elasticity. (Buss, 2001). Elasticity is the percentage effect on state business activities resulted from a 1% change in state and local taxes. Bartik (1991) discovers that the mean of 49 tax studies was -0.25. This suggests that a 10% reduction of all taxes from their original level allows the local businesses and employment to have a long-term 2.5% increase above the growth that would occur without the reduction. Many scholars question the correlation between tax and growth and magnitude of the economic importance. Current economic conditions are likely caused by past economic activity. The areas with tax incentives are often economically different than areas without those (Billings, 2008). To better address the relationship, several recent studies try to separate out the non-tax confounding factors related to economic growth. I will mainly focus on the employment effect and its costs and benefits. Most recent literature suggests that the relationship between employment growth and tax incentives is ambiguous (Gabe & Kraybill, 2002; Luger & Bae, 2005; Billings, 2008). The study of Colorado enterprise zones finds that incentives do not substantially increase the number of job creations by studying firm expansions after two years. The relationship might even be negative. The businesses that received incentives have a decrease of 10.5 jobs per firm. In contrast, the establishments that did not receive incentives have an increase of 6.6 jobs per establishment. The finding is that enterprise zones, part of tax incentive programs, have no positive impacts for job creation (Billings, 2008). But the support is weak because the data is limited and the positive relationship does not apply to all industries studied. According to the case study of North Carolina, some 262 new jobs are induced from four types of tax credit, which otherwise would not be created, based on 1999 data. The results suggest that machine and equipment tax credit induces most jobs (48%) and job creation tax credit is the second-largest component (Luger & Bae, 2005). The mixed results continue the controversy of effectiveness of tax incentives. Even if certain tax incentives result in some new jobs, the effect, however, is not the same in each community. Scholars of these studies find that job creation mostly occurs in more distressed areas, based on population growth, unemployment rate, and per capita income. For example, Enterprise zones in Ohio have to meet one of these certain criteria: lower than state average of employment rate, population growth rate, or per capita income (Billings, 2008). North Carolina divides counties into different tiers and gives a different amount of incentives to each tier. Areas with adverse economies normally receive a larger amount of incentives. With all other factors being the same, firms in distressed areas would have more cost-reduction benefits. Thus, more new jobs are likely to be generated (Luger & Bae, 2005). If we assume that these targeted programs in needy communities do induce some job growth, who actually benefits? The findings on this issue are skimpy. Peters and Fisher (2004) find that firms in enterprise zones hire from metropolitan areas instead of local labor markets. They look at the commuting patterns of workers in the zones in a number of states. Most workers in the zones do not live there; the majority of those who live in the zones do not work in them. BMW reported that they hired 5,000 employees at its Spartanburg, South Carolina plant (Douglas & Paulo, 2008), but all high-skilled workers were from outside of the community. Therefore the locals did not necessarily benefit from the job gain. In addition, job creation from tax incentive programs is costly. The cost per job created in North Carolina in 1999 was about $147,463 on average. The high costs are because the job creation from increases in investment on machine and equipment and R&D are smaller than from direct job creation credits (Luger & Bae, 2005). States buy jobs through targeted tax incentives. BMW in South Carolina pays $1 a year to lease a $36 million piece of land. It pays no land tax, and the building and equipment tax on the first phase is 43 percent lower than what other firms pay (Douglas & Paulo, 2008). Regardless of the revenue loss, state still needs to pay for public services and infrastructure to maintain and attract businesses. These incentive programs make it harder for states to finance important functions, such as transportation systems, public education, and utilities programs (Kaye, 2008). By keeping up the tax incentive programs to attract businesses, states would decrease the ability to offer financing for foundations for future economic growth. The distressed areas would be likely to maintain at the bottom in the competition. However, some scholars argue that several positive externalities are not considered. Based on the study of the BMW plant in South Carolina, the establishment has spread economic benefits through the multiplier effect. Not only have regional suppliers generated more jobs and revenue, but also employees have purchased more at local businesses. The spending leads to more jobs and income in other establishments. The study finds that BMW’s South Carolina plant supports 23,050 jobs through the multiplier effect and that the value of property, such as housing and land, has increased as well. In addition, four counties in South Carolina have received an additional revenue of $2.4 million every year from the increase of property, income and sales taxes (Douglas & Paulo, 2008). 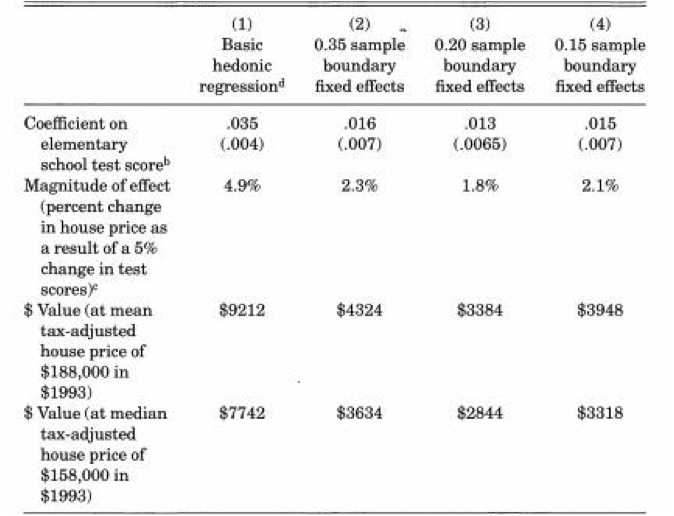 Even though this study shows that targeted tax incentives are beneficial, more research needs to be conducted regarding costs and benefits of employment effect. Scholars have used various methods to study tax incentive effects, such as case study, survey, econometric regression, and simulation. Previous models have adopted regression analysis to evaluate the correlation between state economic growth and tax incentives. But most models have problems in separating out non-tax confounding variables, such as effects of agglomeration economy, firm establishment-levels, and self-selection of enterprise zones (Gabe & Kraybill, 2002). Furthermore, previous static models might produce incomprehensive outcomes, given economies or establishments are dynamic. The recent studies discussed in this review address these issues by modifying previous aggression or simulation models. Gabe & Kraybill (2002) develop a two-stage regression model to control non- incentive growth factors, such as industry, size and age of a firm, regional growth, and infrastructure. This approach helps evaluate effects of incentives after business expansions. The North Carolina case study is conducted through a simulation, which projects the employment growth with firm-level data. This approach demonstrates how firms respond to state tax incentives regarding changing in employment (Luger & Bae, 2005). To eliminate bias of self-selection of enterprise zones, Billings (2008) employs a border-matching methodology, which matches only enterprise zone and non- enterprise zone areas in close geographical proximity. This could control time-varying unobservables and economic conditions, generating more accurate relationship between tax incentives and employment growth. As most related literature suggests, relationship between tax incentives and regional economic growth might be weak at the state level. Two possible reasons could lead to the findings. First, tax effects are likely to be small in larger economies, especially at the state level. Secondly, it is possible that incentives do induce significant new growth in poor and needy communities. But little effects of more developed areas in the state cancel out the growth. Therefore, cases of different states or areas should be studied separately. In addition, more time-varying and micro-level data are needed to produce more in-depth results. Because states are unwilling to conduct evaluations, this issue might be difficult to address. But further studies can be done with available data. Scholars could develop a multilateral simulation to evaluate the effectiveness of state tax incentives because one state could generate tax exportation and incidence to businesses in other states. Further analysis of costs and benefits should be done, given little work on cost and benefit analysis of tax incentive programs. I would like to look closer at effectiveness of distressed areas from the perspective of the locals. The cost and benefit analysis should take into account the multiplier effect and intangible effect, such as benefits for future generations. But the analysis should not include benefits or costs of workers coming from outside of the area. Hopefully the more detailed and quantitative analysis can contribute to the study of the relationship between tax incentives and regional economic growth. Bartik, T. J. (1991). Who benefits from state and local economic development policies?. Kalamazoo, Mich: W.E. Upjohn Institute for Employment Research. Billings, S. (2009). Do enterprise zones work? an analysis at the borders. Public Finance Review, 37(1), 68-93. Burnier, D. (1992). Becoming competitive: How policymakers view incentive-based development policy. Douglas P Woodward, & Paulo Guimarães. (2009). BMW in south carolina: An update. Business and Economic Review, 55(2), 13. Fisher, P., & Peters, A. (1997). Tax and spending incentives and enterprise zones. New England Economic Review, 109-109.
growth of establishments. Journal of Regional Science, 42(4), 703-730.
european union. University of Kansas Law Review, 57(1), 93. Luger, M. I., & Bae, S. (2005). The effectiveness of state business tax incentive programs: The case of north carolina. Economic Development Quarterly, 19(4), 327-345. China’s rapid economic growth has fueled a housing market boom for more than a decade. Property market amounts to a large sector in the Chinese economy, with real estate investment accounting for 13 % of China’s GDP and a quarter of total fixed asset investment (FAI) in 2011. China’s real estate market is primarily driven by population growth, urbanization, and government interventions. Although China is transitioning from a planned socialist economy to a market-oriented economy, the central government continues to intervene the housing market on a regular basis. Therefore, as the country rises in importance in global economic growth, policy makers, investors, and scholars demand a better understanding of the government interventions’ impact on China’s booming housing market. There are many academic papers that explore monetary and fiscal policies’ impact on the property market. Most studies focus on the supply-side interventions, which result in rising demand and housing prices. In the United States, such regulations include land-use restrictions and other zoning rules, whereas in China, a stimulus package is employed to spur real estate investment and house-ownership. Few studies have been done on the demand-side regulations since, beginning in April 2010, the Chinese government suddenly and for the first time changed direction from a period of encouraging home purchase and real estate investment to cooling the housing market. In this brief literature review, I follow the literature on Chinese housing market in a chronological order, with specific focus on housing price movement influenced by macro trends and the recent policy change. I will first discuss literature surrounding the macro-factors (urbanization and migration) that led to the booming Chinese housing market, particularly relevant to major cities such as Beijing. Next, it is important to examine the research that has been done on the Chinese expansionary policy and study its effect on housing prices. Lastly, I will review a working paper that analyzes the new housing regulation, in order to shed light on my research of the policy’s impact on housing demand and prices, using Beijing as a study case. Since the economic reform of 1978, China’s urbanization started to pick up its pace, the urban population grew from 185 million to 607 million and the urbanization rate increased from 19.0% in 1979 to 45.7% in 2008. Major cities are going through dramatic expansion in conjunction with the transition to a market economy. As more and more workers migrate from rural areas to cities, housing policy becomes an important issue that demands extensive research. There are many comprehensive discussions on the formation and development of the Chinese housing market, such as Zheng and Kahn (2007), Deng et al. (2011), and Ding (2012) among many. Zheng and Kahn (2007) choose Beijing as the focus of their research. 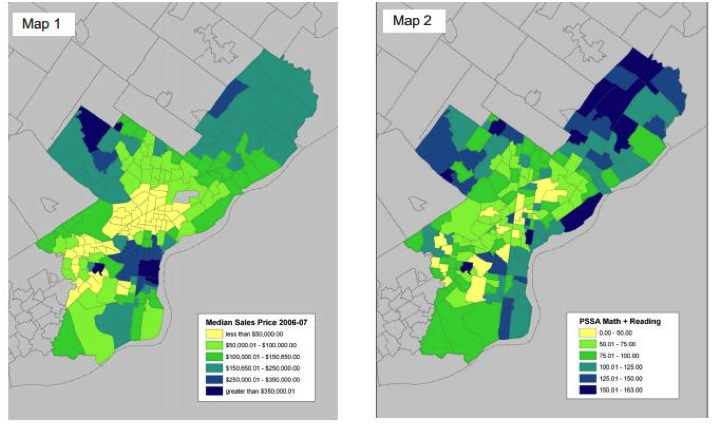 Using two geocoded data sets, they present new evidence on Beijing’s recent free real estate market, including housing price gradient, land price gradient, population densities, and building densities. They conclude that the monocentric model predictions are largely upheld in Beijing: land and property prices decline with distance from the Central Business District (CBD), as does population density. Additionally, they find that local public goods, such as clean air, access to public transportations, and proximity to high-quality schools, are significantly capitalized into real estate prices (2007). Although much has changed in Beijing since 2007, the monocentric model presented by Zheng and Kahn (2007) still holds. As urban population growth continues to exert great pressure on the city’s already overloaded infrastructure, the urban fringe is quickly expanding and being converted from agricultural to urban uses. After new infrastructure took form for the 2008 Summer Olympics, Beijing’s city congestion and air pollution problems became increasingly pressing. A large percentage of residents, especially families with children, who used to live near the city center, begin to move towards the outskirts of the city, substituting rising transportation costs for a better living environment. Having reviewed the general macro-trends of urbanization and the housing boom, it is important to fit the Chinese government’s interventions into the framework and examine the impact on housing demand and prices. Since the central government issued the stimulus package in November 2008, China’s real GDP boosted an annualized 5.7% (from 6.2% to 11.9%) from 2009 to 2010, as reported in Deng et al. (2011). Amidst this phenomenal response, real estate market in major cities boomed exponentially, with housing prices soaring. Deng et al. (2011) is a comprehensive research that analyzes how 2008 monetary and fiscal stimuli have affected the housing prices in major Chinese cities. Employing land parcel auction data from eight major Chinese cities, Deng et al. (2011) uses a pooled hedonic land pricing model estimated by OLS, a sandwich estimator allowing for clustering by city, and random effect regression. The dependent variable in the model is “the transaction price for each parcel in the logarithmic form measured as the price per square meter of the permitted housing floor space” (2011). The results show that residential land auction prices in eight major cities rose about 100% in 2009, controlling for quality variation (2011). Therefore Deng et al. argue that much of the stimulus investment involved highly leveraged purchases of real estate, which benefited the centrally controlled state-owned enterprises (SOEs), fueling a real estate bubble. The model in Deng et al. (2011) is relevant to my research, as I will be using Beijing’s land parcel and residential housing transaction data to examine the housing price movement following the policy reversal in 2010. Since the end of 2008, the government’s expansionary package has led to an unsustainable housing boom with the housing prices rising at an astonishing rate. Many studies have suggested that a credit expansion in such a large scale encouraged not only home purchases for consumption use, but also home investment by speculators (Ding, 2012). On April 17, 2010, the central government announced a new Chinese housing policy, known as the State Council “Document Number 10”. 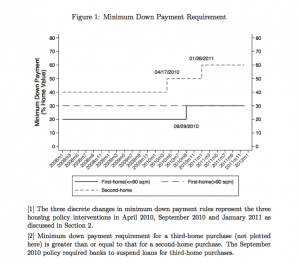 The specifics of the “Document Number 10” include: the minimum down payment ratio for second-home purchases was raised from 40% to 50%, and non-residents can no longer obtain mortgages to buy homes in a city unless they have paid taxes in that city for at least a year (see Figure 1, Ding, 2012). Clearly, the new housing policy’s aim is to curb excessive growth in housing prices and to tame housing speculations, with a central focus on tightening mortgage supply for housing speculators. Researches dealing with the Chinese new housing policy are very limited. Wenjie Ding’s “Evaluating Housing Policy Interventions in China: Using Stock Market Data (2012)” is one among the few working papers. Ding’s work is a comprehensive event study that analyzes the new Chinese housing policy’s immediate impact on publicly traded real estate firms when the policy was first announced on April 17, 2010. Given a lack of appropriate and reliable data, Ding proposes a different strategy in approaching her research question. She collects high frequency financial market data from all publicly traded real estate firms on the Hong Kong Stock Exchange (HKEx), the Shanghai Stock Exchange (SSE), and the Shenzhen Stock Exchange (SZSE), and employs a multivariate regression in which abnormal return is parameterized in an individual stock return equation (2012). Ding detects “cumulative abnormal returns of about -15%, which is consistent with a 2%-4% decline in average house price across the nation. In major markets with inelastic supply, such as Beijing, equilibrium house prices are expected to decline by as much as 6%-10% with a 10 percentage point increase in required minimum down payments for housing speculators” (see figure 4, 2012). Taking into consideration of possible pre-trends bias, Ding extends the event window to 20 trading days before the policy announcement date and uses baseline estimates and other test of robustness to lend support to the estimated impact. The results of Ding’s event study statistically attest to the intention of the “Document Number 10”. Ding concludes that the new housing policy to curb housing price growth results in negative stock returns for real estate firms. 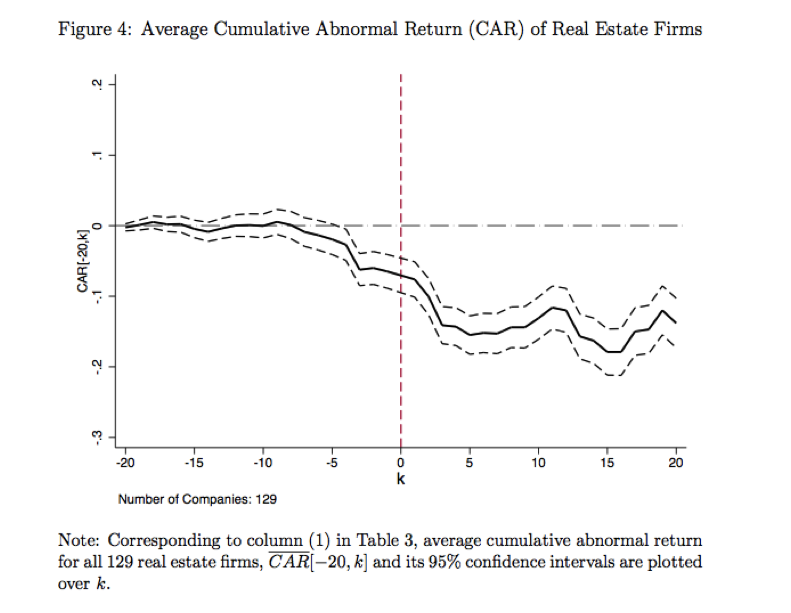 She finds that real estate firms with a diversified portfolio are hedged against housing-specific policy risks, while firms with an affiliation with the central government suffer greater downturns as the government withdraws its support. My proposed research focuses specifically on Beijing’s housing price movement, and will contribute to the existing literature as empirical evidence of the endogenous effects of the “Document Number 10”. Ding’s study is limited to the negative shock after the first announcement of the “Document 10” in April 2010, and ignored the impacts of subsequent amendments in late 2010, and 2011. Instead of using data from all publicly traded real estate firms in China, I will gather Beijing’s individual house purchasing transaction data post 2008, and present Beijing’s real estate market as a case study in analyzing the new policy’s effect on housing prices. With all the background information in mind, I will proceed to present my model in the following section. 2012. 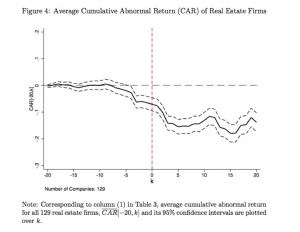 “Evaluating Housing Policy Interventions in China: Using Stock Market Data.” Job Market Paper. The Wharton School, University of Pennsylvania. Deng, Yongheng, Randall Morck, Jing Wu, and Bernard Yeung. 2011. 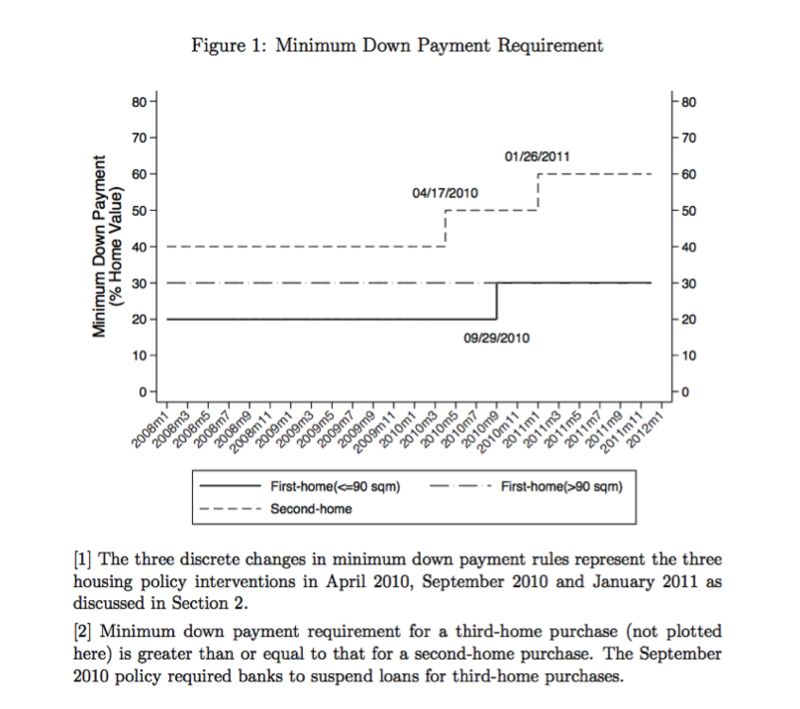 “Monetary and Fiscal Stimuli, Ownership Structure, and China’s Housing Market.” National Bureau of Economic Research. NBER Working Paper No. Kahn, Matthew E., and Siqi Q. Zheng. 2007. “Land and Residential Property Markets in a Booming Economy: New Evidence from Beijing,” Journal of Urban Economics. Source: National Bureau of Statistics (NBS) of China. Source: CEIC Data. Macroeconomic, Industry and Financial Time-Series Databases for Global Emerging and Developed Markets. When trying to understand any type relationship between phenomena, the hardest point to establish is causation. Two seemingly correlated variables do not necessarily cause or have a significant impact on each other. This is the case in studies on the causes and effects of concentrated urban poverty. Factors such as race and social networks have been identified as factors that cause low-income urban communities to form and prevail, but the results are conditional on the data used, theory postulated, and method employed. The following research explores the causes and implications of concentrated urban low-income communities. Urban poverty is usually defined in two ways: as an absolute standard based on a minimum amount of income needed to sustain a healthy and minimally comfortable life, and as a relative standard that is set based on average the standard of living in a nation (McDonald & McMillen, 2008, p. 397). The poverty line, as defined by the U.S. federal government, is an annual income that is three times the cost of a nutritious diet, as computed by the U.S. Department of Agriculture (ibid, 398). These definitions for poverty shape the nature of public policy focused on poverty reduction. However, they define poverty as the standard of living at a given point in time. Low agency (or the ability to make choices for oneself), low standards of living, and limited mobility can also be seen as vulnerability, the definition of which can transcend a monetary and temporal definition. Moser (1998) defines asset vulnerability as the limited ways in which the urban poor can manage their “asset portfolio”, which includes labor, human capital, housing, household relations, and social capital (Moser, 1998, p. 1). This definition differs from those described by McDonald and McMillen in that it identifies those who are at risk of being in poverty and those who are systemically stuck in poverty instead of just those who are currently “poor”. This is possible because by looking at the broader range of assets that are available to the urban poor, researchers can identify their capabilities and ability to recover from crises. Using the asset vulnerability framework, Moser chooses urban research communities that were from different regions of the world but had in common a decade of economic difficulties, declining per capita income, and an increasing rate of urbanization. Additionally, 17.8% – 77.2% of residents in these communities live under country-specific poverty lines (ibid, p. 6). This context provides Moser with information on how vulnerable communities use consumption modifying or income generating strategies to cope with declining real income. The findings show that when households became “poorer”, more women and children join the work force and men migrate to generate remittances. Although this increases a household’s labor asset, it also diminishes its household relations asset, as many children grow up without a paternal figure and family relationships weaken. Increasing a family’s immediate labor asset also erodes its human capital asset, as children are sacrificing their educations for low skill labor. This increases overall vulnerability within a household because it perpetuates poverty from one generation to the next (ibid, p. 9). Moser also found that the human capital asset is largely dependent on economic and social infrastructure provision by local governments. As households earn less income, they substitute more private goods and services for public ones. Household heads’ education level was strongly correlated to household income level. This means that if the public provision of education in times of economic downturn diminishes, the asset vulnerability or urban poor populations also increases. In terms of housing, not having tenure security and legal titles to property made households extremely vulnerable in times of crisis. Not only did they not have incentives to upgrade their homes, but also they were unable to productively generate rent-income from their properties (ibid, 10). This produces a relatively transient population, which can affect human capital development and social capital by weakening social ties and investment in a community. The regulatory environment has a large impact on how households can maximize their housing asset. Similarly, Moser evaluates the tradeoffs inherent in optimizing the household relations asset, as well as the social capital asset. Her study highlights a problem with the traditional definition of poverty; although a family might not be traditionally below the poverty line (for example, if children are generating income), it can still be vulnerable and cut off from economic and social mobility. However, for a government agency, the amount of resources necessary to evaluate households based on asset vulnerability is significantly higher than the amount of resources it takes to measure income. This raises the question of whether public policy should target poverty as defined by income or vulnerability as defined by capabilities. Although Moser sees poverty as the consequence of necessary trade-offs between interrelated capabilities, other scholars see more linear causes and solutions to urban poverty. For example, one study attempts to uncover the effect of racial segregation on urban poverty in Canada. Although low-income areas in cities are positively correlated with a high concentration of minority residents, it is unclear whether this is a causal relationship. Walks and Bourne (2006) use census tract files for the 1991 and 2001 census of Canada to identify “visible minorities”. With this data, Walks and Bourne then classify neighborhoods in Canadian metropolitan areas as isolated host communities (with less than 20% visible minorities), non-isolated host communities (between 20% and 50% visible minorities), pluralism/assimilation enclaves (from 50% to 70% visible minorities), mixed-minority neighborhoods (greater than 70% visible minorities, but no dominant minority), polarized enclaves (greater than 70% visible minorities and over 2/3 of population comes from the same minority), and ghettos (same as polarized enclave with additional criterion that at least 30% of all members of that minority in the urban area must live in the same neighborhood). The purpose of these distinctions is to isolate ghettos, in which minorities are forced into by the host community through discrimination, from minority enclaves, in which minorities choose to strategically live with other people from the same ethnic background. Traditionally, when immigrants arrive in Canada, they will locate in areas with high concentrations of their minority group for support services. However, as they start assimilating in the host culture, they will move to suburbs and decentralize (ibid, p. 276). This leads the authors to conclude that minorities who stay in concentrated urban minority communities are not there by choice, but are rather trapped there because of external forces. To test this theory, they use ordinary least squares regression models that use census tract data for the most segregated metropolises. The independent variables are the proportion of each minority group, the proportion that immigrated to Canada between 1991 and 2001 (recent immigrants), neighborhood type (as defined above), and the type of apartment housing stock (ibid, p. 281). Ultimately, the study did not find that Canadian cities have ghettos, as defined above, despite high levels of spatial segregation in some of Canada’s largest cities. This is because there isn’t one dominant minority in low-income areas inhabited by visible minorities, but rather a few visible minorities that co-inhabit an ethnic community. Further study could elucidate whether these ethnic communities are formed because of social exclusion or by choice. However, the authors did confirm that low income was strongly correlated with certain minority groups, such as Aboriginals, blacks, and Latin Americans (ibid, p. 294). Additionally, it seems that certain types of housing stock, low-income residents, and minorities are highly correlated, with a huge poor minority population residing in high-rise apartments. This probably has an impact on the social capital that Moser mentioned, but more research is needed to verify this. Ludwig et al. (2001) also explore the role of living environments in how poverty affects juvenile crime. The purpose of their study is to uncover the extent to which spatial concentration of low-income families in high-poverty and high-crime urban neighborhoods affects the criminal activities of youth. One explanation for how high-poverty neighborhoods can affect the rate of crime among youth is that they can depress the opportunity costs of crime by restricting access to quality schools, jobs, and role models (Ludwig, Duncan, & Hirschfield, 2001, p. 656). This study tests this theory with data from the U.S. Department of Housing and Urban Development’s Moving to Opportunity (MTO) experiment, which has assigned 638 families from high-poverty Baltimore neighborhoods into three treatment groups (ibid, p. 656). Unlike the previous two studies, which observe natural phenomena in urban environments, this study has a controlled experiment that has less outside influence. The MTO participants are broken down into three groups: the experimental group, the section-8 comparison group, and the control group. The experimental group receives housing subsidies, counseling, and search assistance in relocating to low poverty areas (less than 10% poverty rate) and private housing markets. The section-8 comparison group receives the same as the experimental group, but with no limitation on where they can relocate. The control group receives no aid. The families chosen for this program entered the program voluntarily, which might bias the results. Additionally, almost all of the MTO households are headed by African-American women, who prioritized escaping from gangs and drugs as primary motivators for enrolling in the program. There are 336 teens in the study that are between the ages of 11 and 16. The independent variable in this experiment is the poverty-rate in a low-income family’s neighborhood. The dependent variable is juvenile crime from these families, which is measured through juvenile arrest records. The results show that up to 14 quarters after relocation, teens in the experimental group have significantly smaller violent-crime arrest rates (75 versus 250) but slightly higher property-crime arrest rates (300 versus 50). Possible sources of error for this study include the differences in police action in various locales and different risk-reward ratios for violent and property crimes in various locales. For example, gang involvement was probably more common in areas with high-crime and high-poverty rates, increasing the risk of not joining a gang. Additionally, in low poverty areas, there is probably more expensive property to steal and fewer people watching, driving up the reward in risk-reward analyses. In general, this study shows that environment does seem to have a positive impact on the violent crime rate for children in low-income families. While Moser provides a general framework for understanding poverty, Walks and Bourne, and Ludwig et al. 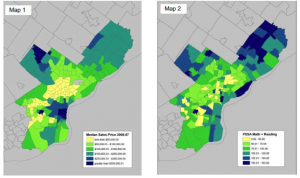 evaluate the implications of poverty’s spatial distribution. They both explore the impact of decentralized poverty, but do not go into more detail about the pathway through which poverty decentralization affects the vulnerabilities of the poor. Is it through social assimilation or better public services that the poor can reduce their vulnerabilities? And if so, can one assume that spatial decentralization actually promotes access to better social networks or better public services? These questions would be great topics for further research. Ludwig, J., Duncan, G. J., & Hirschfield, P. (2001, May). Urban Poverty and Juvenile Crime: Evidence from a Randomized Housing-Mobility Experiment. The Quarterly Journal of Economics , 655-679. McDonald, J. F., & McMillen, D. P. (2008). Urban Economics and Real Estate. Oxford: Blackwell Publishing. Moser, C. O. (1998). The Asset Vulnerability Framework: Reassessing Urban Poverty Reduction Strategies. World Development , 26 (1), 1-19. Walks, A., & Bourne, L. S. (2006). Ghettos in Canada’s cities? Racial Segregation, ethnic enclaves and poverty concentration in Canadian urban areas. The Canadian Geographer , 273-297. It is my hope to explore in subsequent work the Research Triangle Park (RTP) as a factor for economic and urban growth in and around Durham. Accordingly, the sources chosen here are ones that pertain to some facet of this topic. The Jenkins et al paper explores causes of growth in the proportion of employment in high-technology industry, and proposes that state and local government policies can be effective in achieving high-technology employment growth. Kodrzycki et al investigate the factors associated with resurgent post-industrial cities, finding chief among them competent leadership and long-term collaboration between the private and public sectors. Seeking to understand the institutional contexts that underlie high-tech clusters, Sternberg et al compare federal, state, and non-state cluster policies in the dual cases of the RTP and the Greater Munich area in Bavaria, Germany. This 2008 study is concerned with the issue of whether state and local policies can induce growth in the proportion of high-technology employment. The authors argue that sustainable economic growth necessitates a transition from older to newer, high-technology industries, especially as traditional high-paying manufacturing jobs continue to be outsourced. Accordingly, the proportion of total employment in high-technology industries is vital for future economic growth, more so than is the pure numerical increase of high-technology jobs, which the authors believe has received far more scholarly interest. Another point of difference between this and other studies is that this work emphasizes the role of agglomeration effects in the proportional growth of high-technology employment, whereas, according to the authors, others have focused primarily on location effects. Jenkins et al find that location effects may explain numerical growth in high-technology employment, but that location effects fail to account for the proportional increase of high-technology jobs. In their analysis, the authors use data from 291 Metropolitan Statistical Areas (MSAs) from 1988-1998 to construct a generalized linear model that predicts the probability of percentage change of high-technology employment in this time period. Data include population density, 1988 mean high-technology wage, various amenities associated with location effects, and numerous determinants of agglomeration effects (469). The generalized linear model finds many factors to be positively correlated with increasing shares of high-technology employment, among them research parks, public venture capital programs, technology incubators, small business innovation research, and technology grants and loans. The conclusion that research parks are correlated with an increasing proportion of high-technology employment is significant to my interest in the RTP. Moreover, the authors propose that research parks magnify the effects of private venture capital firms in increasing the share of high-technology employment. Perhaps this amplification in high-technology employment that arises from such a partnership will emerge as a matter of importance in the context of the RTP. The study’s conclusion that “state and local government can play a strategic role in high-technology development” (456) is certainly relevant to the past, present, and future relationship between North Carolina, Durham, and the RTP. The authors indicate that their study does not address the distribution of benefits from increasing shares of high-technology employment in the labor pool. This has relevance for Durham, where it is unclear to me at present whether unskilled workers that are largely excluded from positions in high-technology employment benefit from growth in this industry. The study also points to other works that address “counterproductive ‘bidding wars’” for investment in high-technology industry (477). Though only mentioned in passing, this appears to be a question of significance for an evaluation of how RTP has and will continue to affect economic and urban growth in Durham. This study is concerned with identifying factors that are associated with economic growth and revitalization in post-industrial cities. The authors investigate 25 municipalities that were similar to Springfield, Massachusetts in 1960. Ten of these cities experienced significant economic growth after restructuring their economy on a post-industrial model. The authors brand these as “resurgent” cities and consider them in detail. In doing so, the authors hope to elucidate potential policy options for catalyzing growth in Springfield. The study is largely qualitative in scope, examining factors responsible for success in various resurgent cities. Among the data used to evaluate urban success are income levels, poverty rates, population figures, educational attainment, and employment in various industries (e.g. manufacturing versus healthcare). The authors stress leadership and long-term collaboration between the public and private sectors as factors chiefly responsible for the success of the studied resurgent cities. This applies to the case of the RTP; for example, Link and Scott (2003) emphasize the importance of the vision of certain individuals and coalitions to RTP’s success. Kodrzycki et al find that the initial preponderance of manufacturing in a metropolitan area is the factor most correlated with post-industrial growth. Namely, studied cities that were more reliant on manufacturing in 1960 are less likely to experience dynamic post-industrial economic growth. The study notes that each of the 10 resurgent cities studied had more employment in healthcare and in social assistance than in manufacturing by the mid-2000s. This transition from manufacturing to healthcare is a prominent feature of Durham, and will likely come up as a subject of investigation in my future work. The authors also cite resurgent cities’ focus on cultivating human capital for a transition to a knowledge-based economy. The authors contend that planning for economic growth has experienced a paradigm shift in recent years. Economic policy in the 1980s and 90s emphasized attracting mega-firms to a metropolitan area. In contrast, planners today focus on the human capital necessary to sustain innovation – the quality matters more than the quantity of workers. Also important for post-industrial economic resurgence, the authors argue, is the successful social and economic integration of minority populations. Both of these necessities apply to Durham. The three major universities that anchor the RTP serve to develop and attract human capital. On the other hand, I am currently uncertain about how successfully Durham has integrated its black, Hispanic, and less-educated populations into an economic regime heavily marked by the RTP. This is likely an issue I will explore in further detail. Believing that literature has often taken the regional cluster model of high-tech firms for granted without exploring the context from which these clusters emerge, Sternberg et al search for institutional determinants of success for cluster policies in their study. The authors compare the governmental policies that have nurtured two technological clusters: the Research Triangle Park in North Carolina, and the Greater Munich area in Bavaria, Germany. These two regions were chosen because they epitomize two very different “varieties of capitalism”: a liberal market economy in the case of the RTP, and a coordinated marked economy in the case of the Greater Munich area (1063). As described by Ketels et al (2006), clusters in liberal market economies are typically formed by the private sector and focus on exports. On the other hand, clusters in coordinated market economies are subject to greater national oversight (1067). This study interprets qualitative data in the form of interviews with 87 cluster policy experts from both North Carolina and Bavaria. Drawing upon these interviews and a survey of literature in the field, the authors describe key features of cluster policy in the United States and North Carolina, and in Germany and Bavaria. Among the differences: the private sector is the driving force for clustering in NC, which is competition-driven, whereas it is the public sector that drives clustering in Bavaria, which is consensus-driven; the state of North Carolina is the main agent of cluster policy for the RTP, whereas the German federal government cooperates closely with the Bavarian state; the US federal government primarily plays a role in cluster policies by awarding financial grants and fostering a favorable business environment, whereas the German federal government has a history of using contests to dole out large grants while largely allowing the state to pursue its own, autonomous cluster policies. Sternberg et al propose comparative weaknesses of the RTP and Bavarian cluster models. In the case of the RTP, they find that local cluster policies are very dependent upon individual agencies, such as the North Carolina Department of Commerce and the seven regional nonprofit organizations that market the RTP and plan its development. With regards to Germany, the authors propose that clusters often arise through opaque public-sector processes, with resultant difficulties in mobilizing private sector cooperation (1076). This study’s examination of the federal and local policies, as well as the nonprofit actions, that have contributed to the growth of the RTP should be of use to me in later work. However, the authors clarify that an evaluation of whether the technological cluster is in fact an effective model of economic growth is beyond the scope of their study. This question of whether the cluster model, which has been successful for the past half-century for the RTP, will remain useful to Durham and North Carolina for future high-tech industry and economic growth is an issue that I will likely want to consider in later research. Jenkins, Craig J., Kevin T. Leicht and Arthur Jaynes. “Creating High-Technology Growth: High-Tech Employment in U.S. Metropolitan Areas, 1988-1998”. Social Science Quarterly. Vol. 89, No. 2, Pp. 456-481. 2008. Ketels, C. H.M., G. Lindqvist, and Ö. Sölvell. 2006. “Cluster Initiatives in Developing and Transition Economies.” Report, Ivory Tower AB, Stockholm, http://www.cluster-research.org/dldevtra.htm. Kodrzycki, Yolanda K. and Ana Patricia Muñoz. “Reinvigorating Springfield’s Economy: Lessons from Resurgent Cities”. Federal Reserve Bank of Boston. Community Affairs Discussion Paper No. 09-7. 2009.